A radiation oncologist is a medical doctor who has special training in management of patients with cancer, in particular involving the use of radiotherapy, as one area of their cancer treatment. They also have expertise in the treatment of noncancerous conditions using radiotherapy. Radiation oncologists are responsible for monitoring the patient and organising imaging and other tests, in order to create and action a management plan for a patient. Radiation oncologists work closely with other medical specialists, especially surgeons, medical oncologists and palliative care physicians, as part of a team caring for patients with cancer. Radiation oncologists also work closely with radiation oncology medical physicists and radiation therapists to plan and deliver radiotherapy. Radiation oncologist in Pune have an important role in communicating with patients,their family members and other carers in the management of the patient's cancer and overall care. Radiation oncologists have overall responsibly for determining and setting the most suitable amount of radiation (from high energy X-rays, electron beams or gamma rays) to deliver to a patient and the way that this will be carried out. How Does Radiation Work ? Radiation therapy works by damaging the DNA of cells. The damage is caused by a photon, electron, proton, neutron, or ion beam directly or indirectly ionizing the atoms which make up the DNA chain. Indirect ionization happens as a result of the ionization of water, forming free radicals, notably hydroxyl radicals, which then damage the DNA. In the most common forms of radiation therapy, most of the radiation effect is through free radicals. Because cells have mechanisms for repairing DNA damage, breaking the DNA on both strands proves to be the most significant technique in modifying cell characteristics. Because cancer cells generally are undifferentiated and stem cell-like, they reproduce more, and have a diminished ability to repair sub-lethal damage compared to most healthy differentiated cells. The DNA damage is inherited through cell division, accumulating damage to the cancer cells, causing them to die or reproduce more slowly. One of the major limitations of radiotherapy is that the cells of solid tumors become deficient in oxygen. Solid tumors can outgrow their blood supply, causing a low-oxygen state known as hypoxia. Oxygen is a potent radiosensitizer, increasing the effectiveness of a given dose of radiation by forming DNA-damaging free radicals. Tumor cells in a hypoxic environment may be as much as 2 to 3 times more resistant to radiation damage than those in a normal oxygen environment. 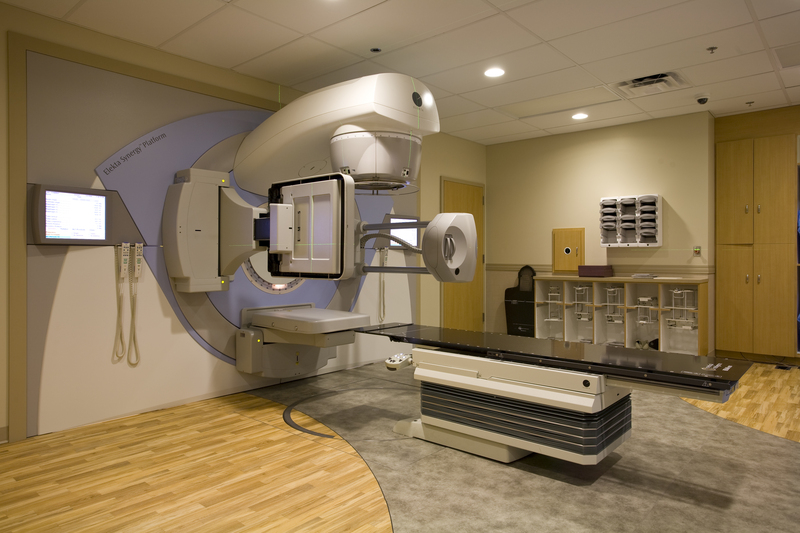 Radiation therapy, radiotherapy, or radiation oncology, often abbreviated RT, RTx, or XRT, is therapy using ionizing radiation, generally as part of cancer treatment to control or kill malignant cells and normally delivered by a linear accelerator. Radiation therapy may be curative in a number of types of cancer if they are localized to one area of the body. The central nervous system (CNS) is the part of the nervous system consisting of the brain and spinal cord.The central nervous system is so named because it integrates the received information and coordinates and influences the activity of all parts of the bodies and it contains the majority of the nervous system. Prostate cancer also known as carcinoma of the prostate is when cancer develops in the prostate, an organ in the male regenerative system.Most prostate tumors are moderate developing; be that as it may, some develop generally rapidly.